I changed the format of my blog this morning. I think I like it a bit better than my old format. Of course, I tired of the old format is all. It served me well for several years. Time to move on. Editing follows a different format, with the text block I’m working on peeking out over the top of my published posts. Oddly- in case I forget, I suppose- there is a little porthole to the upper left hand where my Gravatar self-portrait peeks out at me, laughing, no doubt, that I fancy people actually read this stuff. Ha! It has some odd and intriguing edit icons I can’t wait to try, though I suspect I need to wait or risk blowing out what I’ve typed so far. “Hide/Show Kitchen Sink”, I will click on you any second now to see what you do! Well, inserting photos is much simpler. 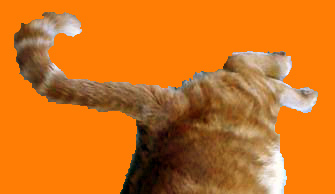 This is my old Gravatar, an insolent rump of my late cat Louie pointed into the air. It still serves me other places since google and I can’t agree on how I go about changing all things once. Tedious! In that instance, the up-ended rump works. I like being able to see text the way it will look. The old format, you didn’t see images or formatting until you visited the preview or published post. I don’t like that every posting I’ve ever done shows on one “page” because it slows things down considerably. I need to figure out how to change that to show just the current post on each page. Earlier, it was doing just that: Somewhere down the line I clicked on something, eh!? I’ll figure it out. Posted on Sun - 2 June 2013 by weggieboy	• This entry was posted in miscellany and tagged miscellany, new blog format, pros and cons on change. Bookmark the permalink.